Bathroom reading is among the least spoken of and most ubiquitous of activities. Rarely does anyone admit to having read the most fascinating Rolling Stone article while on the john, but chances are that - if someone is telling you about the most fascinating Rolling Stone article - it was read on the john. With the advent of iPhones and the internet in the palm of your hand, classic bathroom reading isn't as popular as it once was. 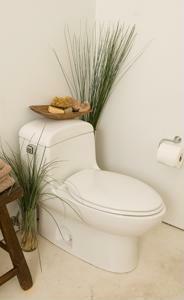 But it's still not unusual to use a home's commode and find a neat stack of magazines perched on the back of the toilet. In fact, if you've got just such a stack of reading yourself, what might that say about you? Consider these fine magazines and books as examples. 1. The New Yorker. More likely than not, you went to a liberal arts college, and despite the fact that you are still paying student loans (only four decades left! ), you nonetheless find the cash to drop on renewing your yearly subscription. Also, the free tote bag is really useful. 2. Joke book. You have never once told a single joke found in this book, mostly because they are all terrible. At least four or five (of the 101 guaranteed gut-busters) don't make any sense at all! Despite this, you are a lover of puns and what some might call "dad humor." 3. Book of obscure facts and information. You watch a lot of Jeopardy, and often find yourself befuddled by what seem like general knowledge questions that you don't know. When did Alexander the Great reign? You have no idea, but if someone wants to know the name of his horse, it was Bucephalus. 4. Entertainment Weekly. You subscribed to this magazine as part of a deal way back in high school, but have kept renewing and revising your address as you've moved. While you don't care all that much about Iron Man 4, it's still really exciting to see the set photos. You also subscribed to People Magazine, but just for the crosswords. 5. Anna Karenina. You are a very serious bathroom reader. Or perhaps you have terrible digestion. 6. Nothing. This probably means that you have an extremely regimented sense of hygiene. You regularly polish your vanity, scrub at the bathroom tile and wash your hands often. Or perhaps you're a smartphone user. 7. A library book. Etiquette only counts if you're found out.